Klahowya’s football team will honor former players Gian King and Lucas Weaver before the start of the Eagles’ game against North Mason on Friday. The game, which is slated for a 7:30 p.m. start at Silverdale Stadium, is the second of a doubleheader with North Kitsap and Central Kitsap at 5 p.m. The King and Weaver families will be named as honorary captains and the choir and band will be on hand for the tribute. Fans are encouraged to arrive early. 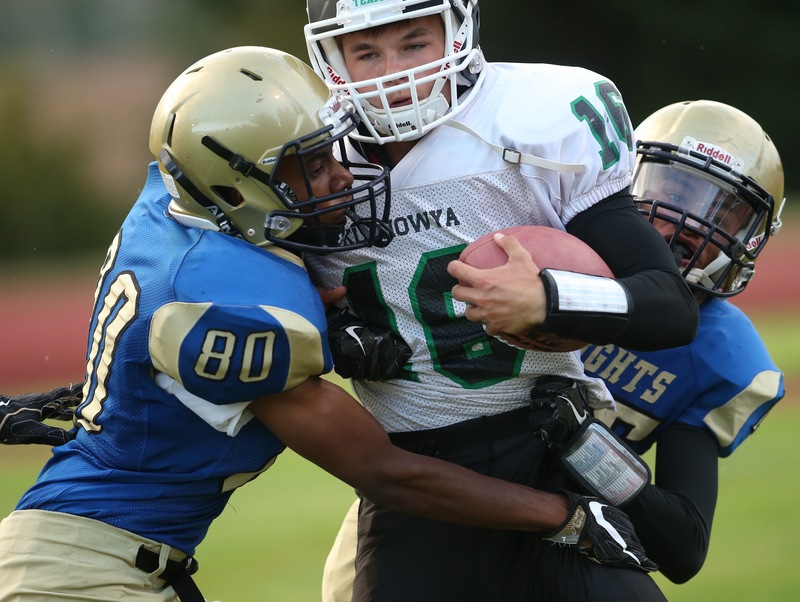 Klahowya and Bremerton battled to kick off Week 1 of high school football. Click here for the kitsapsun.com Game of the Week — Klahowya at Bremerton. Highlights: The teams traded first quarter touchdowns before the defenses stiffened up. Klahowya recovers a fumble in the end zone in the fourth quarter to take the lead. Highlights: DeAndre Sincere put Central Kitsap up 14-0 on Olympic on a 57-yard run in the second quarter. Highlights: Zach Clark with a 10-yard TD reception for the game’s opening score. Vikings have taken advantage of five turnovers.